Like in many other conquest games, there is a wide variety of buildings and structures that can be constructed in Lords Mobile, each of which come with their own unique functions and an importance that can vary depending on the stage of the game you’re currently in. In fact, this variety is actually one of the most advertised aspects of the game given that, with some exceptions, it is emphasized that you can demolish and construct different buildings as per your requirements. However, in a game with so many different buildings, how can you know which ones are the best for every occasion? In this article, we’re going to list most of the buildings in Lords Mobile, as well as go over their functions and relative importance in each stretch of the game. We’ve already spoken at great lengths about these buildings in the Resources and Buildings Guide for Lords Mobile. Production buildings are, like their name suggest, those structures that are exclusively dedicated to producing resources for your city. 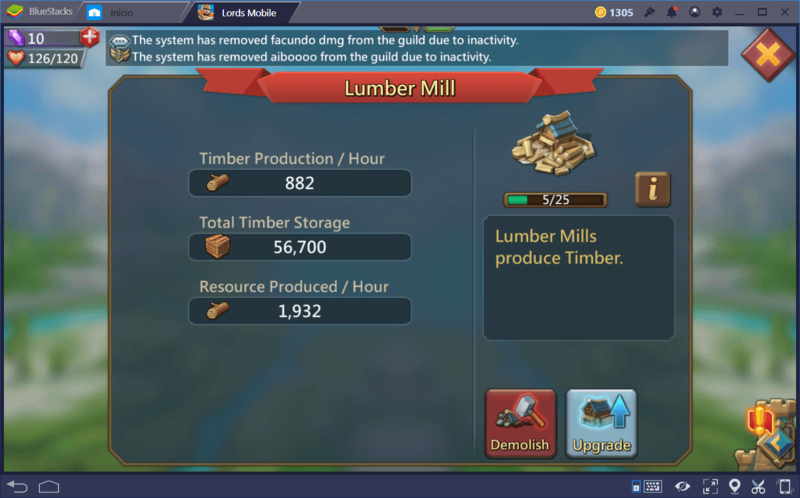 However, in contrast with other games, production buildings in Lords Mobile are not only charged with the production of the resources; they also store said resources in their own warehouses. That’s right, all the materials they produce are stored right there in the same building. What this means in terms of gameplay is that, once that building has reached maximum capacity, production is halted. As a general rule of thumb, you’ll never want the production to stop. In this sense, you should always be constructing or researching something, or simply upgrading your production buildings to increase their storage capacity. There are 5 production buildings in total: Mines, Farms, Lumber Mills, Quarries, and Mansions, which produce ore, food, timber, stone, and gold, respectively. To discover which of these buildings you should focus on every phase of the game, be sure to check out our production guide. This is one of the most important buildings in the game. 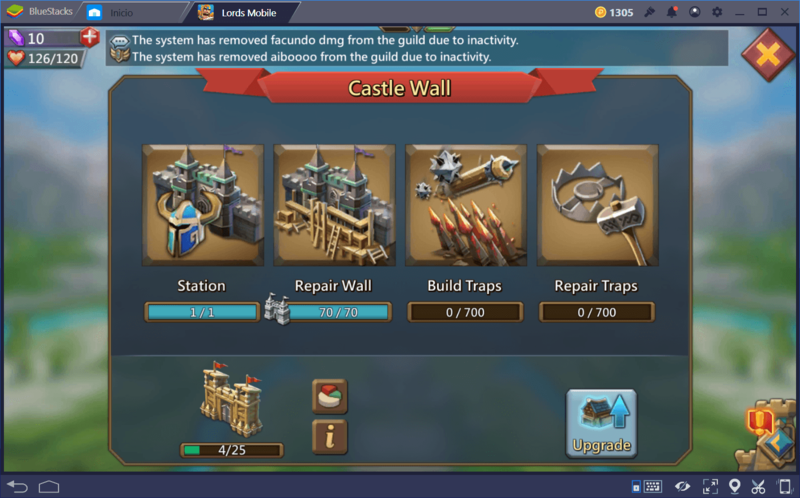 The development of each and every structure is intrinsically tied to your castle, considering that buildings cannot be upgraded past the castle’s current level. For this reason, you must always seek to improve your castle to its maximum possible level at the time. Besides allowing you to upgrade other buildings, leveling your castle will also increase the troop capacity of your turf, as well as your might, and the number of “helps” you can receive. Upon reaching castle level 5, you will gain access to the trading post. Furthermore, upon reaching castle level 17, you will gain access to the treasure trove. Of great utility and importance. 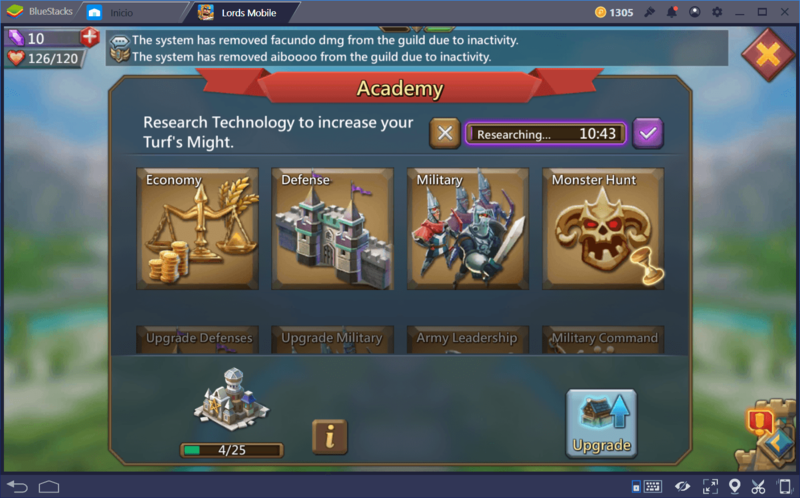 In the academy, you can perform various development projects that allow you to gain permanent improvements for your turf, including upgrading its construction speed, the speed at which you produce resources, the time it takes to train new troops, and even the capacity of your production buildings, among many others. Your academy should be researching something at any given time, so make sure to swing by frequently so you don’t waste time that could be spent developing technologies to improve your odds of success in the game. The barracks are the only structures in which troops are trained in this game. 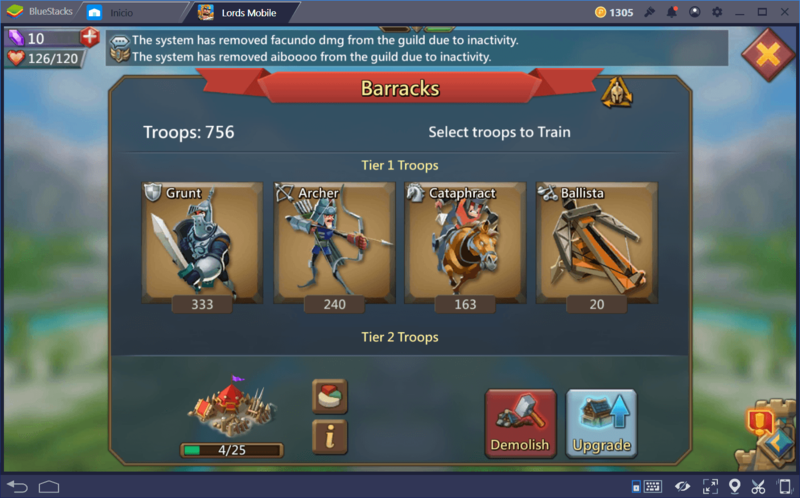 In contrast to other conquest games where different types of troops are trained in different structures, every single unit in Lords Mobile is created in the barracks; from the standard infantry unit, to even siege weapons. By upgrading your barracks, you will increase your might and will be able to train more units simultaneously. In the first level, your barracks will only be able to train 20 units at once. However, upon reaching its maximum level, a barracks can train up to 5,000 units in one go. Besides your troops, your castle walls are the main source of defense against any would-be attackers seeking to pillage your city. By upgrading your walls, they will have more HP, and will also be able to accommodate more traps in order to deter aggressors from breaching your city. With enough traps, even if they manage to break the wall, their forces will be significantly weakened, so your ground troops can sweep the rest. When damaged, your walls regenerate on their own. Of the utmost importance in the late game, considering that, through the use of this building, you will be able to host allied troops in your turf in order to defend against enemy attacks. In the same manner, through the embassy, you will be able to send your own troops to your allies to assist them in their defense against invaders. As you progress through the game, the importance of the embassy will become evident as you will need to defend against attacks of larger magnitudes and will likely rely on your allies to do so. Another important building in any part of the game. The infirmary rescues soldiers that are wounded in combat and allows you to heal them to bring them back to fighting capacity. In this building, you will be able to heal any and all soldiers that were wounded in battles in your turf, or up to 60% of troops that were injured in battles outside your turf, such as in sieges and rallies. However, your infirmary is limited by its capacity; if full, all troops that are injured are instantly killed instead of sent for healing. 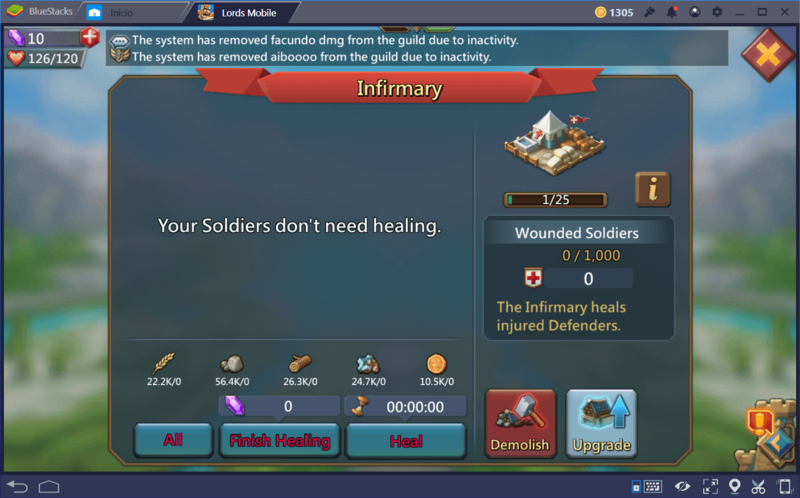 We suggest to always swing by the infirmary to verify that there no units in need of healing so that your army is in top condition at all times. In the advanced stages of the game, your armies will be able to take enemy leaders prisoners during sieges on other turfs, which will be held in your prison. The prison is unlocked upon upgrading a manor to level 10. Once you upgrade the prison to its maximum level, your allied troops will receive a bonus to their attack if you have an enemy leader imprisoned within. Furthermore, upon reaching prison level 17, you will be able to execute the prisoner (which is a lengthy process). This building allows to send and receive resources to and from allied players. The trading post is, arguably, one of the most important buildings in the late stages of the game. Since you won’t be needing them, you will probably demolish all your farms upon reaching a certain level, which you will promptly replace with lumber mills, mines, and quarries. For this reason, all your food supplies will come from gathering missions and from exchanging resources with your allies through the trading post. While slightly different, these two buildings perform essentially the same function. In case of an enemy attack, you can send your heroes and some units to the shelter. Units that are in the building during an attack are impervious to damage and cannot be captured by any means. 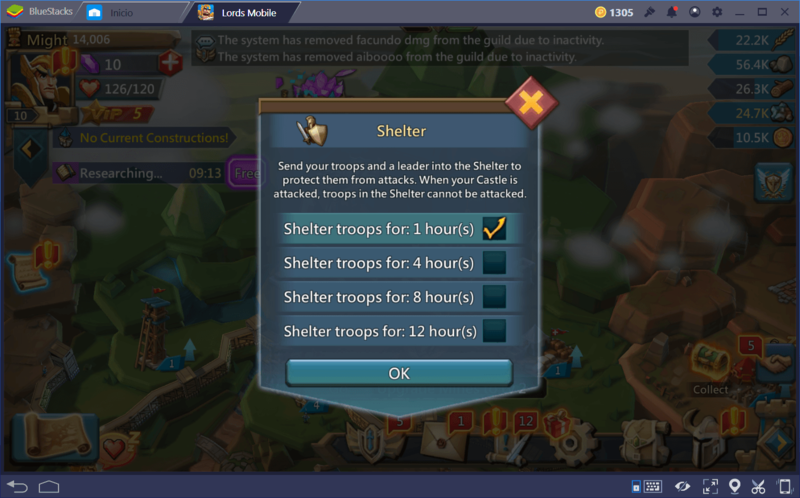 The shelter is available from the very beginning of the game; it cannot be upgraded and can provide protection to chosen units for a minimum of 3 hours, and for up to 12 hours at a time. The vault, is essentially the same as the shelter, but with resources instead of units and heroes. 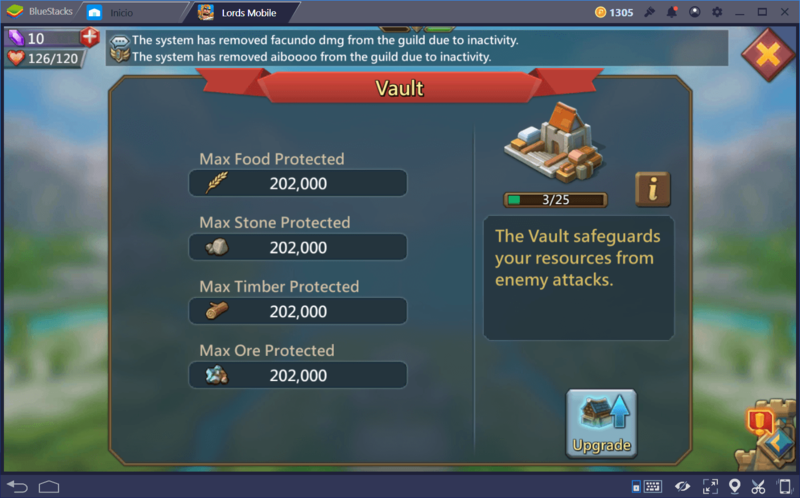 A good vault ensures that a part of your resources will stay untouched by the enemy. If you are under constant siege by enemy forces, consider switching to a better guild or, at the very least, upgrading your vault to a decent level. Very important for the creation of items that can be equipped to your heroes to increase their performance in Heroes’ Assault mode. 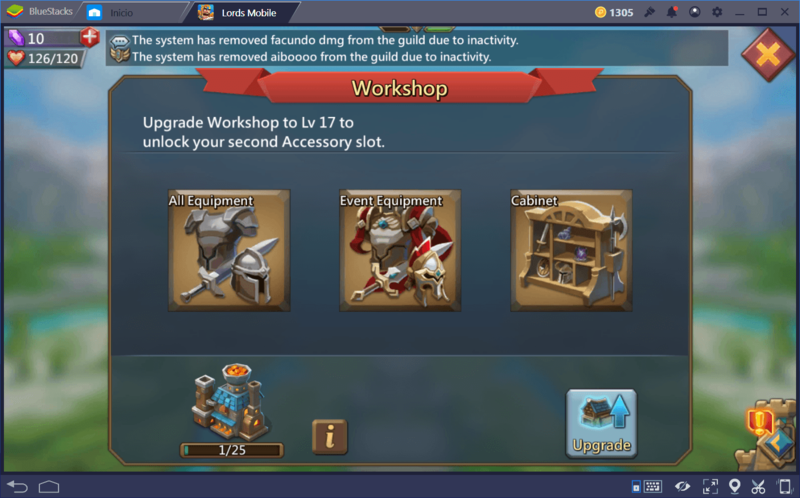 In the workshop, you will be able to use all sorts of materials to create powerful weapons, armors, and accessories that will help to improve the skills of all your heroes. This was our list of most important buildings available in Lords Mobile. As you can see, there is a great variety. Their utility, however, will vary in accordance to the point of the game in which you are, as well as depending on your personal approach to the game. In this sense, if you’re a fan of Heroes’ Assault, you’ll probably want to focus on the workshop. In the same vein, if you want to increase your military might, you will likely research technologies to increase the power of your troops, as well as prioritize upgrading your barracks over everything else. Do you have any other suggestions on which buildings to focus on to improve your odds of success at the game? Let us know in the comments below!